In 2014, the Preserves launched its award-winning Next Century Conservation Plan, an ambitious framework to ensure the agency will be a national conservation leader in its second century. Implementation of the plan is underway, including the completion the Natural and Cultural Resources Master Plan, the first formalized restoration plan and the creation of the Conservation and Policy Council comprised of civic and business leaders who function as an independent advisory council. In 2015, the Preserves reintroduced family and group camping for the first time in 50 years. Today, more than 100,000 visitors have visited the Forest Preserves’ new and revitalized campgrounds. The campgrounds serve first-time campers, as well as many urban youth, providing them the opportunity to connect with nature. 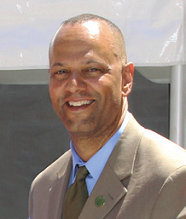 Mr. Randall is active in numerous civic and professional organizations. Affiliations have included the Chicago Community Development Commission (chair), The Chicago Plan Commission, Commission on Chicago Landmarks, the Public Buildings Commission, the Delta Institute Board, the Woodlawn Children's Promise Community, Woodlawn New Communities Program (NCP), American City Planning Directors' Council, American Planning Association, Illinois Parks and Recreation Association (IPRA), the National Recreation and Parks Association (NRPA), the South East Chicago Commission (SECC) Executive Committee, the Harper Court Foundation Board, and the 53rd Street TIF Advisory Board. Mr. Randall has received local and national recognition for his contributions to recreation, leisure and open space programs. Recent recognitions include the Society for Outdoor Recreation Professionals’ Individual Service Award, the National Association of County Parks and Recreation Officials Outstanding Public Official Award, and the Civic Federation’s 2017 Motorola Solutions Foundation Excellence in Public Service Award.